Removing trans fats (Part 1): June 2018 date looms, is the industry leveling up? You are in : All News > Removing trans fats (Part 1): June 2018 date looms, is the industry leveling up? 26 Mar 2018 --- Later this year the long-awaited US regulation comes into force concerning the complete removal of trans fats (PHOs) and by June 18, 2018, manufacturers must ensure that their products no longer contain partially hydrogenated oils for uses that have not been otherwise authorized by the US Food & Drug Administration (FDA). However, this is not just a government-imposed regulation in the US, consumer preferences are shifting on an international scale and the broader picture shows that even as the early summer compliance dates edges closer and PHOs are essentially banned from processed foods, people around the world don’t want them anyway. PHO's have a long history of use as food ingredients. The two most common PHOs currently used by the food industry, partially hydrogenated soybean oil and partially hydrogenated cottonseed oil, are not listed as GRAS (Generally Recognized as Safe) or as approved food additives in FDA's regulations. However, these and other commonly used PHOs such as partially hydrogenated coconut oil and partially hydrogenated palm oil have been considered GRAS by the food industry based on a history of use before 1958. According to the American Heart Association, trans fats raise your bad (LDL) cholesterol levels and lower your good (HDL) cholesterol levels. Eating trans fats increases your risk of developing heart disease and stroke. It’s also associated with a higher risk of developing type 2 diabetes. The American Heart Association recommends cutting back on foods containing partially hydrogenated vegetable oils to reduce trans fats in your diet and preparing lean meats and poultry without added saturated and trans fats. In January 2006, FDA required the food industry to declare the amount of trans fat in food on the Nutrition Facts label. FDA data indicate that many processed foods have been reformulated to reduce the amount of trans fat since the requirement was instituted, but a substantial number of products still contain PHOs. Trans fat will never be completely gone from foods entirely because they occur naturally (in small amounts) in meat and dairy products, and is present at very low levels in other edible oils. FDA set a compliance period of three years. This has allowed food companies to either reformulate products without PHOs and petition the FDA to permit specific uses of PHOs. Many companies have already been working to remove PHOs from processed foods and the FDA anticipates that many may eliminate them ahead of the three-year compliance date. “There had been a significant decline timeline in the use of artificial trans fats and companies were already moving away from using this in their products. This action could have spurred some of them to move a little faster than they may have been planning,” she notes. The FDA encourages consumers seeking to reduce trans fats intake to check a food’s ingredient list to determine whether or not it contains partially hydrogenated oil. Removing PHOs from processed foods could prevent thousands of heart attacks and deaths each year. In the US, trans fats have been listed on nutrition labels of processed foods since 2006. According to Naum, if your product has less than half a gram of trans fats you can list it as 0. “On labels, all trans fats are required to be listed, not only for the industrially produced PHOs, and so even after June 2018, some labelling of trans fats would remain on the label because there are naturally occurring trans fats in some foods,” Naum states. 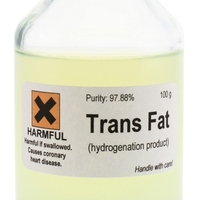 “The labeling requirements are not affected by the determination, although we are removing artificial trans fats from the food supply, there are still naturally occurring trans fats and so on the label provides information to consumers who should be looking to avoid trans fats in their diets,” adds Naum. As the June 18th, 2018 date looms, Naum believes that industry reformulation has been the most significant challenge. However, she also maintains that the three years that was given to reformulate was the amount of time that the industry indicated would be sufficient. Often in the food industry, sodium is the bad guy. But is this all about to change? FoodIngredientsFirst asked Naum how the two compare about labeling and regulation. “Excess sodium in the diet can lead to high blood pressure, which increases the risk of strokes and heart attacks. Researchers have estimated that reducing sodium intake by one-half teaspoon a day could prevent nearly 100,000 premature deaths a year, as well as up to 120,000 new cases of coronary heart disease, 66,000 strokes and 99,000 heart attacks. FDA put out draft voluntary guidelines for the reduction of sodium in the food supply. The guidelines address the fact that most of the sodium people consume comes from processed foods, not from the salt shaker. Salt has many functions, including those related to the texture of food, especially in cheeses, and it also is a preservative. For that reason, the draft sodium reduction targets would differ for various categories of food,” she notes. “Reduction of PHOs, which are the primary source of trans fats, and sodium are both moving forward because the actions both benefit public health,” Naum says. You can read Part 2 of this report here.